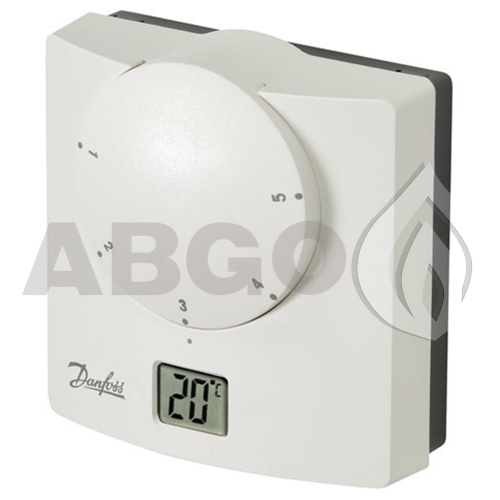 The Danfoss RET-B is a traditional room thermostat with added functionality, ideal for upgrades where conventional two wire electro-mechanical thermostats are being replaced. RET-B is a battery powered room thermostat that offers the advantage of an easy to use setting dial plus the convenience of an LCD to display temperature. Available in hard wired and wireless models, the RET-B is an ideal product in the upgrade and replacement market since it only requires a two wire connection. Styled upon the RMT and RET room thermostat range, RET-B provides accurate electronic temperature control without the need for an external power supply. The design utilises a micro-processor which, as well as providing accurate temperature control, also drives a small LCD display which, during normal operation, displays actual room temperature and which changes briefly, to show setting temperature, whenever the setting dial is moved. The micro-processor design also brings with it many sophisticated functions not normally found within such a thermostat. These include optional chrono-proportional regulation and cycle rate adjustment, heat or cool operation, compressor delay timer if cooling operation is selected and Fahrenheit or Centigrade temperature scale.